Think you can spot a sociopath/psychopath? Think again. According to experts, this behavior affects 3% to 5% of the population, which could mean more than 15 million people in the USA with these characteristics, or up to 1 in 20 people – higher percentages than one might realize. The people affected are millions more. Are you one of them? In general, psychopaths come from all walks of life. They’re our friends, lovers, co-workers and leaders. They’re outgoing and persuasive, dazzling you with charm and flattery. Knowing the profile characteristics might help you to avoid being scammed or hurt by someone you trust. Or, you might already be in a situation and are confused by the others behavior. Be aware of the characteristics. Be smart. What is a narcissistic sociopath? A narcissistic sociopath is someone with a combination of narcissistic personality disorder and definitive behavioral signs of sociopathy. People with narcissism are characterized by their excessive and persistent need for others’ admiration and positive reinforcement. They generally have grandiose opinions of themselves and believe they are superior to other people. Narcissists are also frequently convinced that they are above the normal responsibilities and obligations of everyday life, so they usually have significant difficulties maintaining employment or relationships as a result. The narcissistic sociopath has this type of personality along with a noticeable lack of regard for the rights of others and a tendency to regularly violate those rights. The narcissist with the sociopathy reacts strongly and sometimes even violently to negative feedback. True sociopaths generally do not respond to criticism or care what others may think of them. A narcissistic sociopath is unable to tolerate criticism and needs constant praise, as well as deference from other people. Many with this condition present themselves in the best light possible and are able to easily charm others to gain their trust. (1) They are habitual liars. They seem incapable of either knowing or telling the truth about anything. (2) They are egotistical to the point of narcissism. They really believe they are set apart from the rest of humanity by some special grace. (3) They scapegoat; they are incapable of either having the insight or willingness to accept responsibility for anything they do. Whatever the problem, it is always someone else’s fault. (4) They are remorselessly vindictive when thwarted or exposed. (5) Genuine religious, moral, or other values play no part in their lives. They have no empathy for others and are capable of violence. 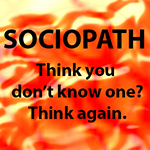 Under older psychological terminology, they fall into the category of psychopath or sociopath, but unlike the typical psychopath, their behavior is masked by a superficial social facade. They never recognize the rights of others and see their self-serving behaviors as permissible. They appear to be charming, yet are covertly hostile and domineering, seeing their victim as merely an instrument to be used. They may dominate and humiliate their victims. Has no problem lying coolly and easily and it is almost impossible for them to be truthful on a consistent basis. Can create, and get caught up in, a complex belief about their own powers and abilities. Extremely convincing and even able to pass lie detector tests. Not concerned about wrecking others’ lives and dreams. Oblivious or indifferent to the devastation they cause. Does not accept blame themselves, but blames others, even for acts they obviously committed. Sociopath has a strange network of Support People ranging from “consultants,” to skilled-workers, to enabling co-dependents that back him up when he wants to go after his Target. Most of the Support People have their own Psychological problems. My Sociopath. No conscience. Lack of Remorse, Shame or Guilt. Believe they are all-powerful all-knowing, entitled to every wish, no sense of personal boundaries, no concern for their impact on others. The end always justifies the means and they let nothing stand in their way. Shallow Emotions When they show what seems to be warmth, joy, love and compassion it is more feigned than experienced and serves an ulterior motive. Outraged by insignificant matters, yet remaining unmoved and cold by what would upset a normal person. Since they are not genuine, neither are their promises. Drama King: There is always conflict going on in a Sociopath’s life and it involves a “bad person,” “bad business” or “bad transaction.” My Sociopath. Excerpt from: “The Sociopath Next Door: The Ruthless vs. the Rest of Us” by Martha Stout Ph.D. There currently is no form of psychotherapy that works with those with antisocial personality disorder, as those with this disorder have no desire to change themselves, which is a prerequisite. Over time, she says, “their appearance of perfection will begin to crack,” but by that time you will have been emotionally and perhaps financially scathed. This entry was posted in Personality Profiles and tagged Authoritarian, Blame others, Charming, Con, Control, Cunning, Divisive, Grandiose sense of self, Lying, Manipulative, Narcissistic, Personality Disorder, Rule the world, Secretive. The ideas, concepts and opinions expressed on this blog site are intended to be used for educational purposes only. The blog pages are available with the understanding that the author and contributors are not rendering medical advice of any kind, nor is the information on this blog site intended to replace medical advice, nor to diagnose, prescribe or treat any disease, condition, illness or injury. The blog author and blog contributors claim no responsibility to any person or entity for any liability, loss, or damage caused or alleged to be caused directly or indirectly as a result of the use, application or interpretation of the material on this blog site.